It is difficult for any student to succeed, or even just get by in school, when their home life is unstable. Imagine how much more difficult it must be when there is no one place to call home. Youths and their families throughout the country struggle with homelessness and, thus, struggle with education from as early as kindergarten. Homelessness can and does take on many forms—couch hopping, sleeping in a vehicle, staying in shelters, and renting hotel rooms, among others. Recognizing the challenges homelessness can present to students, legislators and advocates sought to provide some stability to the youths' daily lives, and did so with the passage of the McKinney-Vento Education of Homeless Children and Youth Assistance Act. The federal law provides funding to states so that youths experiencing homelessness can either be enrolled immediately into school or can receive transportation to/from their school of origin. This helps alleviate some of the uncertainty as families look for stable housing and offers stability to youths in terms of education. The law, however, only covers youths up through 12th grade and does not eliminate a young person's lack of stable housing. What happens then when a youth graduates from high school and prepares to go to college while still experiencing homelessness? What options exist to help the student—still very much a young person—succeed? The truth of the matter is, options are limited for students. Universities and colleges that provide housing are just now beginning to address the issue of homelessness. "This is not a population that they [colleges] are accustomed to," says Marcy Stidum, LCSW, MPA, an associate director for counseling and psychological services at Kennesaw State University (KSU), director of the CARE Center at KSU and chair of the Higher Education Committee for the National Association for the Education of Homeless Children and Youth (NAEHCY). "There's a lot of disbelief that this population exists. And a lot of the time, you have to convince people that if this population does exist, the youths didn't do anything wrong." She adds that even when schools recognize the issue, there is the hurdle for schools to accept that it is an issue that they need to address. "A lot of people ask, 'Do we want to be known as a homeless university?' [They argue that] this is not what we were designed to do. We were designed to educate. It's a one-dimensional perspective of what they are when they need to have a holistic perspective. "The reality is," Stidum continues, "higher education is no longer a privilege. It's a mandate. You can't get a decent paying job—you can't get a living wage, without a college degree anymore." Even with colleges and universities becoming more aware (and ideally proactive), there are still a limited amount of solutions for youths. The first option is for students to live on campus in college housing. KSU is an example of a university with 365 Housing. This means that when students become residents, they sign a 12-month contract. However, housing is not a part of the admissions package at KSU, meaning it comes at an extra cost and many students experiencing homelessness cannot afford that cost. Other schools may offer an extension on housing if the student also agrees to take on more classes, but this presents another financial burden. And for schools where 12-month housing or an extension through breaks is not an option, being an on-campus student only provides stability through the fall and spring semesters. Even the few months between high school graduation and the first college semester can be a barrier. "I have personally recruited 15 students to KSU, and of those 15, the majority were classified as unaccompanied homeless youths. When they come to college, one of the factors is how are they going to get through the summer. They may not have housing or may have been sleeping on a couch. For two months, I made sure that they came in the summer, even if they were accepted [to begin] in the fall," Stidum says. Other possibilities include opening up emergency housing and creative staff contributions/innovations. Stidum's CARE Center, for example, has an apartment on campus. "Through fundraising and grants, the donations pay for a year's lease," she says. "Students can stay there up to 14 days, and typically by the time they leave, together we have a plan for long-term housing." External from the colleges are agencies. Though not widespread, there are organizations in the country working to provide host homes to students experiencing homelessness. They seek volunteers in the communities surrounding the colleges to take in a student, much as they might for an international student. And then there is the idea of shelters. Most communities have homeless shelters available to families and/or adults. Individual college students, however, may not be comfortable staying in an adult shelter. There are concerns about safety, as well as how an 18 year old will fare. It is key to remember that traditional college students are still very much youths. Those experiencing homelessness have often had to grow up faster than others, but that does not mean they are fully grown adults. Recognizing the need for a specialized shelter, students at the UCLA decided that a homeless shelter specifically for college students, run by college students was in order. "It was the idea of two engineering students who started looking at college homelessness and whether there is homelessness among college students," describes Michelle Talley, LCSW, field education faculty at the UCLA Luskin School of Public Affairs, department of social welfare. Talley is on Bruin Shelter's advisory board and the faculty advisor for Bruin Shelter programs. "The engineering students started talking to faculty around UCLA that had worked with [issues surrounding] homelessness, and within 15 months, the shelter opened. Bruin Shelter opened in October 2016 and is the first of its kind. To be clear, there are shelters on college campuses throughout the country. Stanford University's Outreach Center provides both a drop-in center and subsidized housing to homeless community members, for example. However, no other school offers housing specifically for college students, managed by college students. Bruin Shelter is currently housed at the Mount Olive Lutheran Church of Santa Monica. "Residents come in the evening, and they're there until the morning. They receive an evening meal and a continental breakfast. 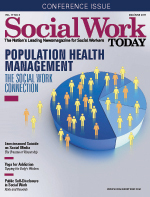 Medical and social work students provide case management," Talley says. Currently, students at UCLA, Santa Monica College, and Loyola are able to stay at the shelter, which serves up to nine students at a time. When Talley and Social Work Today spoke, there were five residents. Students are able to stay for the entire school year, though a shorter residency is not out of the question. "The goal is to establish permanent housing," Talley says. "So every 90 days they reassess." Of the residents that have stayed at Bruin Shelter since October, some have successfully found student housing and moved on, while one was able to graduate. The youths were due to graduate in December 2016 and simply needed the housing assistance through the final months. There are, of course, challenges. There's a complexity to students experiencing homelessness that extends beyond basic housing. Even with planned case management services available, the students running the shelter have had to work to overcome unforeseen obstacles. And, as Stidum mentioned, semester breaks are breaks, particularly when student volunteers run a shelter. "Through winter break, we did not stay open," Talley says, "but we did find housing for everyone. Case managers are working on the summer." Aware of the options—limited and localized as they are—available to homeless college students seeking housing, what can a social worker do to assist youths in need? For one, they can contact NAEHCY with or on behalf of a student to determine what resources exist. Many states and many schools have a point of contact who will help with the needs of students experiencing homelessness, Stidum explains. While reaching out, gather as much information as possible and focus on forming lasting professional relationships. It's likely that a social worker won't reach out until they have a specific youth in need. "But while this might just be one kid, there are five or six more coming," Stidum notes. If working from within a college to bring forth the need for more programming, Stidum suggests starting with cold, hard data. "If you can put data in front of them, then you can start to move the needle. "The other thing that helped is that my students are willing to share their story. You cannot tell a student that this [college homelessness] doesn't exist when they're telling you. It's the data, and it's the stories." Stidum hopes that increased awareness and increased programming will lead to furthered research, which will lead to policy—policy that, like the McKinney-Vento Act, can provide some semblance of stability to youth experiencing homelessness while in college. "These students, they want to be successful," she says. "They are the most determined people I have ever met in my life."